EXCELL today announced the launch of its new IP67 waterproof counting indicators, a stainless steel weighing indicator with counting facility ideally suited to industrial scales for accurate check counting of tools electrical components, parts and inventory control. The EXCELL PCH3 IP67 Waterprrof Counting Indicator is a fully featured counting indicator, the PCH3 offers a numeric keypad for unit weight and sample entry and three large LCD backlight displays to show unit weight, total weight and number of pieces. 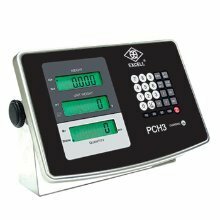 With valuable features like check counting included, the PCH3 offers the ability to warn the user when a pre-defined count has been reached. PCH3 can also adjust to the parameters and resolution of any attached scale base, whether a floor scale, bench scale, or laboratory balance. "EXCELL is best known for it's counting scale in theindutry. PCH3 can help you efficiently and accurately count a high volume of identical parts. Whether for incoming or outgoing goods, counting scales ensure you have exactly the number of parts you require," said C.C Lo, President and CEO at EXCELL. "Our PCH3 precision counting scales can all weigh even the lightest parts with an accuracy of over 99%, minimizing the operator error often found when hand counting. The counting scale range is tough enough to stand up to any industrial environment and can stand up to overloading and shock loading while counting quickly and accurately." said Jeff Chien, Vice President of Global Sales & Markeing at EXCELL. EXCELL counting scale series are simultaneously used as general high-resolution weighing scales by customers throughout the world.